These natural rawhide treats are available in Small, Medium and Large sizes. Choose the correct size for your dog’s toy: Fits: Bouncy Bone L, Bristle Bone L Product Features 16 Rawhide dog treats Size "C" fits select M/L and L Busy Buddy® toys Ingredients: Natural Rawhide, Sorbitol. .. Description: The Busy Buddy Waggle is a barbell style dog toy made from soft rubber making this toy easy on your pets teeth. The Busy Buddy Waggle’s super, flexible middle allows the top to be playfully “wagged” and shaken back and forth. Features the Treat Meter which randomly dispens.. The dental toy dogs love to chew! The durable nylon bristles and rubber nubs of the Bristle Bone provide a unique chewing experience. The irresistible, replaceable Gnawhide treat rings ensure long-lasting enjoyment and are easy to replace. The design of the Bristle Bone makes it impossible for dogs .. Stimulate your pet with the interactive Bouncy Bone™ toys. The design of the durable nylon bone & rubber ball provide dogs with an extended chewing experience - the Gnawhide® treats last longer than giving treats alone & dogs are stimulated to chew the toy well after the irresistible treats .. Description: The Waggle’s™ super flexible middle allows the toy to be playfully “wagged” and shaken. Dry food and treats are randomly dispensed from the Treat Meter™. Made of natural rubber. Ideal for strong chewers. Give your puppy a toy that will keep him busy and reward him for appropriate .. Description: The Busy Buddy Puppy Waggle is a barbell style dog toy made from soft rubber making this toy easy on your puppy’s teeth. 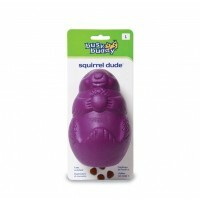 The Busy Buddy Puppy Waggle’s super, flexible middle allows the top to be playfully “wagged” and shaken back and forth. Features the Treat Meter which randomly dis..
"Kibble Nibble appeals to a dog’s natural instincts by enticing him to actively engage in mealtimes." Description: Make dogs work for their food with the Kibble Nibble. 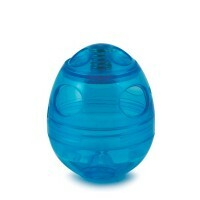 This activity ball mentally and physically stimulates dogs by appealing to their natural prey and stalking drives. The custom.. The Squirrel Dude’s extreme durability holds up well under the toughest chewers and its unpredictable bounce will have pets playing for hours. The Treat Meter randomly dispenses dry food and treats as your dog plays. Made of natural rubber. Ideal for strong chewers. About Busy B.. Description; Provides a multi-sensory appeal to keep dogs interested and motivated to play. Use the Tug-a-Jug to play games, teach training commands or feed meals. Treats dispense as the toy is tipped, tugged and rolled. Product Features Large > 50 lbs. Suitable for: Goldens, Rotties .. Description; Provides a multi-sensory appeal to keep dogs interested and motivated to play. Use the Tug-a-Jug to play games, teach training commands or feed meals. Treats dispense as the toy is tipped, tugged and rolled. Product Features Medium 20 - 50 lbs. Suitable for: Beagles, Sheltie.. Description The Tug-a-Jug™ provides a multi-sensory appeal to keep your dog engaged and motivated to play. Its unique design allows dogs to see, smell and hear the treats as they roll around in the jug. The Tug-a-Jug not only dispenses treats, it can also be used for obedience training and feedin.. The Original Terry Ryan Design. Premier Quick Access Obedience Treat Pouch Manufactured By Premier Pet Products - The Treat Pouch has a water resistant lining, a strong hinge, two storage pockets, a ring attachment and is big enough to fit your entire hand inside More Details: Th..